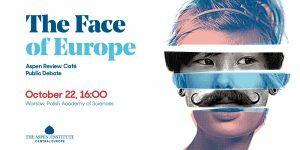 On behalf of the Aspen Institute Central Europe, we invite you to a public debate of the Aspen Review Café series, organized on the occasion of publication of the recent issue of Aspen Review Central Europe quarterly called “The Face of Europe”. The public debate will be held on October 22, 2018, 4 pm at Polish Academy of Sciences in Warsaw, Marie Skłodowska-Curie Room. The debate will be chaired by Ivan Hodáč, the President of the Aspen Institute Central Europe, and will be held in English.